Few days back I suddenly had craving for Sweets, especially Indian milk sweet. I am really not crazy about the sweets available here in the Indian store. So I decided to try make one by myself. I came across this recipe from Show me the curry﻿. It was so simple and easy to make. We all loved it. 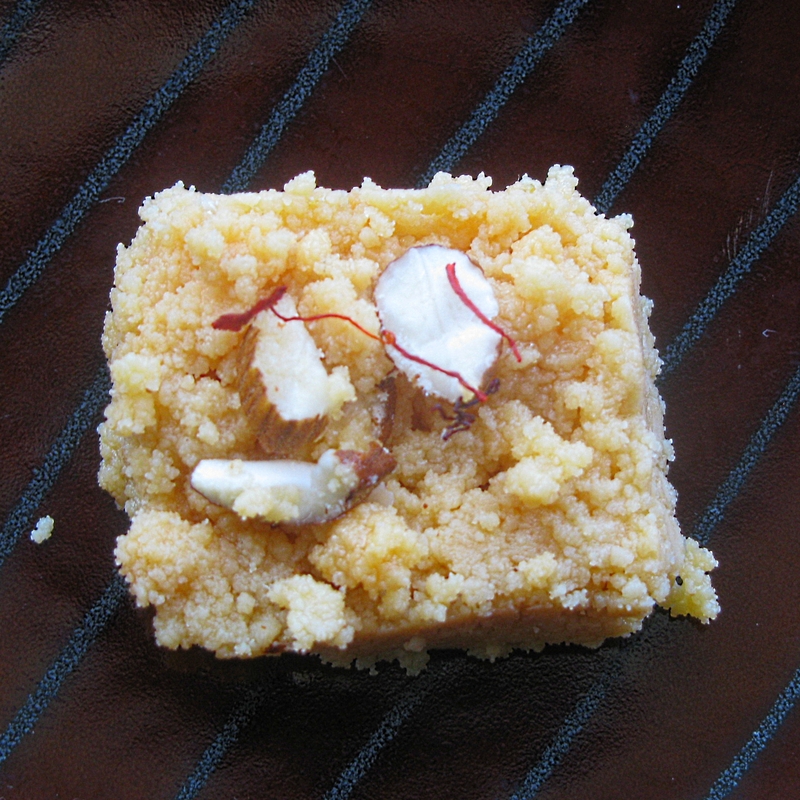 Its Kalakand made with ricotta cheese and condensed milk using microwave. Sounds, interesting right? Everytime I make this, it quickly disappears and I never really get to click the pictures at all. Somehow this time managed to take some pictures. 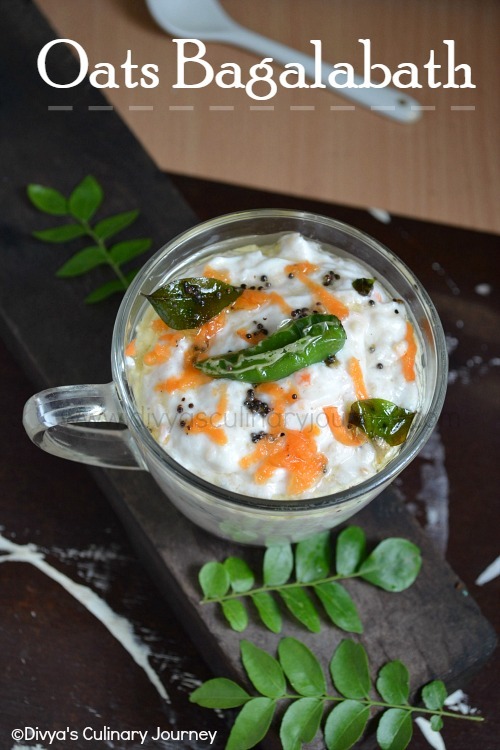 In a microwave safe bowl, mix riccotta cheese and condensed milk together without any lumps. It will look similar to dosa/pancake batter. Cook in microwave uncovered for 5 minutes.Then take the bowl out mix well and keep them back in the microwave for 5 more minutes. Then again take them out mix well and keep them in the microwave covered for 3 minutes. Mix them well again. Now keep the lid cross covered, so that the splatter is avoided and also there is enough space to vent the steam from the bowl out. I used the splatter screen for that purpose. From now on keep microwaving with lids cross covered and every 3 minutes take out mix well and repeat it till they are done.It will be solidified with a grainy texture. It takes 6- 8 minutes for this. Remove the cardamom seeds and powder them with sugar. Add this to the mixture and mix well. Prepare a tray by applying the butter. Transfer the mixture to this prepared tray and flatten them and press them firm. Then sprinkle the chopped nuts and lightly press them so that they stick well. Cover them well and let them set for few hours or refridgerate them for an hour till they are set. Slice as per the desired shape and enjoy. excellent one!.......have to try this out! 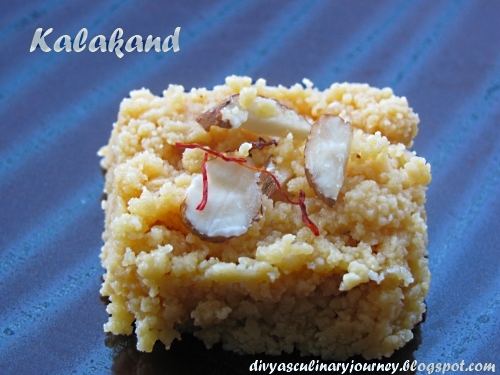 quick and delicious..a must try..
Just love this short cut kalakand, yummy. Quick recipe,looks divine,thanks for sharing. Even I do this, looks very good.. Thanks for sending to MEC Divya, i do the same way too.